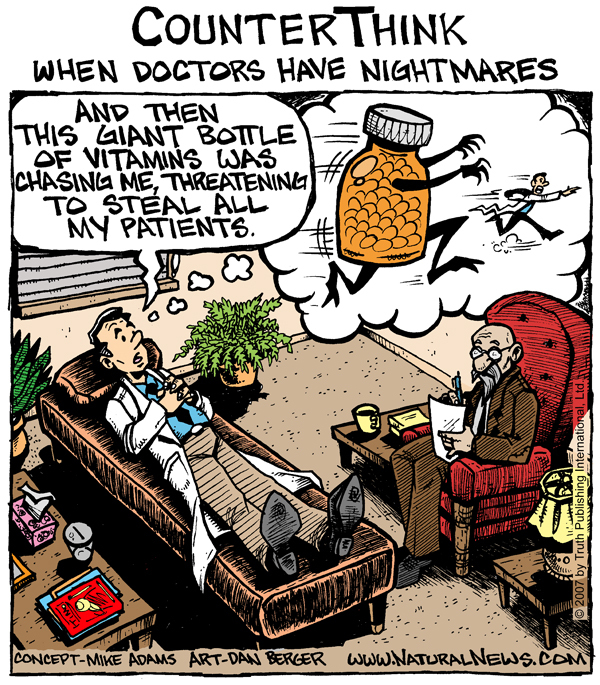 Ever wonder what doctors have nightmares about? 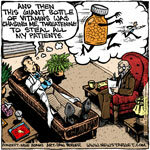 Perhaps it's about giant bottles of vitamins stealing their patients! Vitamins, you see, help keep people healthy and prevent disease, and that reduces the repeat business for doctors. And I'm not talking about those cheap, chemical-based store-bought multivitamins you got on sale at the local Wal-Mart; I'm talking about quality vitamins with ingredients like methylcobalamin (high-grade vitamin B12), natural vitamin E, CoQ10, and easily digestable minerals like magnesium malate. 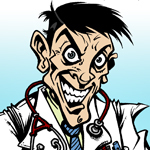 Of course, not all doctors are afraid of vitamins and dietary supplements. In fact, most doctors actually take at least one dietary supplement, and it's a little-known fact that doctors often take vitamins even when they refuse to tell their patients to take them! Why is that? Because prescribing vitamins can get you in trouble with the state medical boards, almost all of which are run by Big Pharma sympathizers. Any doctor they discover to be prescribing dietary supplements gets targeted to have their medical license stripped away. When talking about vitamins, it's important to distinguish between synthetic vitamins and naturally occuring vitamins. Synthetic vitamins come from sources you'd never want to eat. Vitamin E, for example, is actually produced as a byproduct of the photography film manufacturing industry. Various B vitamins can be synthesized from petroleum chemicals. Synthetic vitamin C has no resemblance to the natural, full-spectrum vitamin C found in nature. I actually believe that synthetic vitamins are quite toxic to the human body, and it's no surprise to learn that when researchers want to discredit vitamins, they almost always conduct studies using synthetic vitamins. Natural vitamins from plants, however, are a completely different story. They're fully bio-compatible with the human body, and they come from full-spectrum sources found in nature. When plants manufacture vitamins, they do so in a way designed to protect their own health (plants have to make their own vitamins to survive), and when we eat those plant-based nutrients, then we are ingesting a diverse array of natural medicines present in synergistic harmony. The Naturally Occurring Standards Group (www.NOSG.org) is a relatively new organization that's working on certifying vitamins and functional foods that are based on natural sources. All this explains why superfoods, microalgae, herbs and superfruits often provide some of the best nutritional medicine of all: Because they are not isolated extracts or chemical copycats of single plant molecules. When you eat microalgae or other superfoods, you are ingesting an array of hundreds of different plant-based medicines in a natural matrix of healing synergy. That simply cannot be replicated by any plant extract or pharmaceutical. No man-made laboratory can recreate what nature can do in your backyard. Nature didn't intend for us to eat only one chemical from the tomato (lycopene), nor one chemical from green tea (EGCG). Nature intended us to eat the whole plant, or at least the juice of the whole plant (which is why juicing is such a healthy nutritional therapy that literally reverses serious disease and greatly enhances health). Doctors rarely prescribe juicing or superfoods. They simply have not been taught the value of these nutritional therapies, and there is currently no effort underway in modern medicine to teach doctors about nutrition. Thus, the focus on prescribing pharmaceuticals as the primary treatment for disease will likely continue for a few years more, and some doctors will continue to fear vitamins, herbs and dietary supplements. 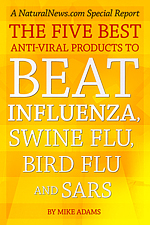 Thanks to intentional distortions and lies from the medical journals, doctors have now been brainwashed into thinking that vitamin C is dangerous, vitamin E will kill you and that St. John's Wort interferes with practically every prescription drug. Note that doctors are never told prescription drugs interfere with nutrition, even though nearly every pharmaeutical sold today causes at least one critical nutritional deficiency.